Bri Lee studies a shot during a photoshoot in downtown Fargo. Photo by Sage Larson. Swirls of blue, purple and green tangle around the supercilious, cobalt peacock as he ignores the clicks of the camera, the wisps of Fargo’s cool winter and the laughs from the photographer and her model. With a little push from family and friends and a trip abroad, Concordia Junior Brianne “Bri” Lee gained the confidence and determination to pursue her career as a professional photographer and designer as an undergraduate, studying graphic design and English writing. Spring semester freshman year, Bri decided to apply to study abroad. “I was at that point where I needed to get out of here,” she said. A year later, she flew over to Florence, Italy. It was in Italy that Bri took her first photography classes–digital and fashion photography. Not only did she learn more about her craft, she learned more about herself. She brought that mindset back to Moorhead. 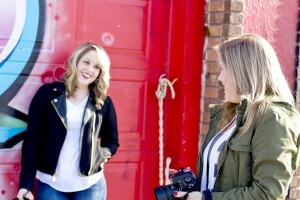 Through a connection with her father, Bri had the opportunity to capture photos of the creation of a short film for Grassfire Productions. After that, she collaborated with Experience Blur, Midwestival and the Online Communications and Marketing department at Concordia, where she has had opportunities to shoot photos for online articles and events like Orientation and Les Miserables. Bri has grown up hearing the whirr and clicks of the camera. Her father, Ron Lee, has been a photographer for over 40 years. He started photographing professionally his senior year at Concordia, at American Crystal Sugar Company. Ron and Bri took father-daughter trips throughout her childhood, and Ron would allow her to take photos with his camera. Bri believes these trips helped her fall in love with the craft. Ron sees it starting earlier. Concordia junior Kayla Weber poses for her friend Bri. Weber has been modeling for the freelance photographer since they met freshman year. Photo by Sage Larson. To showcase her work to others, Bri posts her photos on social media. That’s how she caught Midwestival’s attention. At Alley Fair, an event that showcases downtown Fargo’s culture, Bri took a picture and tagged Midwestival on Instagram. The online magazine started liking all her photos. Bri researched the company and found that they were in need of photographers. 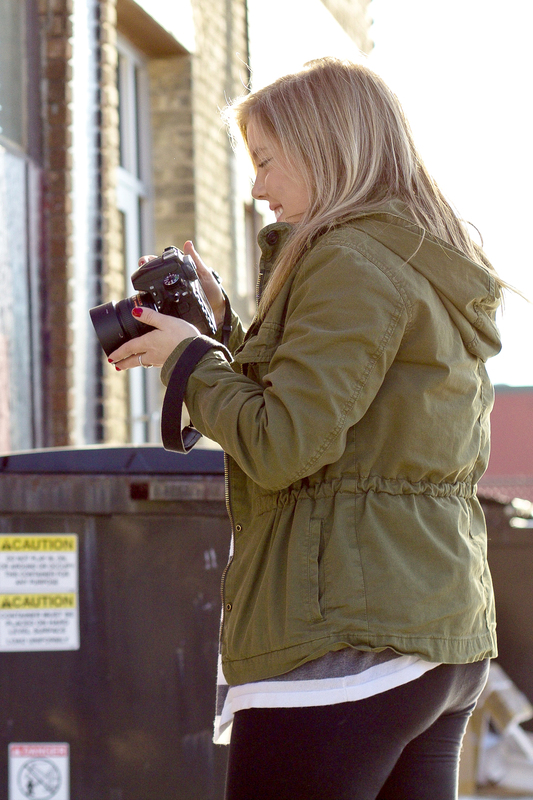 She reached out to them and within a month, she had her first assignment–photographing Fargo. Recently, Bri’s graphic design professor Jeff Knight asked her to be a part of the Design Planning Committee for TEDx Fargo, an opportunity he only offered her and one other student. Bri continues her impromptu trips with her dad when they can. She also does random photoshoots with her friends. A frequent model for her shoots is Kayla Weber, her friend since freshman year. Their photoshoots started during freshman year when Weber’s parents asked for a photo of her for their Christmas card. Sophomore year, Bri and Weber tried a different twist on their usual shoots. Two years later, the friends spend Saturday driving around Fargo to find an obscure location that challenges Bri’s creative thinking. Turning towards the future, Bri would like to work in advertising or media focusing on magazines or social media. “I want to be surrounded by creative people,” Bri said. Ron sees her going in a similar direction. Bri hopes one of her collaborations moves to something more. She’s waiting to see where they go. “I’ve always been that person who had a plan, but now I’m letting things happen the way they do,” Bri said. This article was submitted by Sage Larson.